I’m going to get right in to today’s super easy recipe! Spud saw this video on Facebook a few weeks ago and wanted to make these cute little cookies! You can really use any chocolate chip cookie recipe you’d like (you can even use refrigerated dough for a really really easy recipe!) 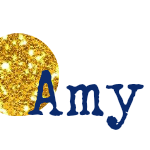 – I included my favorite, in case you’re looking for a delicious, fool-proof recipe! When I told Spud I was going to talk about the cookies, he made sure to tell me that I could write that he really likes these cookies, but I absolutely could not say that he loves them. The little stinkers in his class have been following any “I love…” statement with “Then why don’t you marry it?” Little goofballs. So, Spud definitely does not want to marry these cookies, so he only likes them, not love – hahaha! Preheat the oven to 350 degrees F and line baking sheets with silicone mats. Use a large spoon to stir in the mini chocolate chips and semi sweet chocolate chips. Bake the cookies for 10-12 minutes or until the cookies are set. Immediately after removing from the oven, press 1-2 dark chocolate chips onto the hot cookies. Move to wire racks and cool completely. Melt the remaining dark chocolate chips and place them in a piping bag fitted with size 2 piping tip. Pipe eight legs onto each chocolate chip to make a little spider. 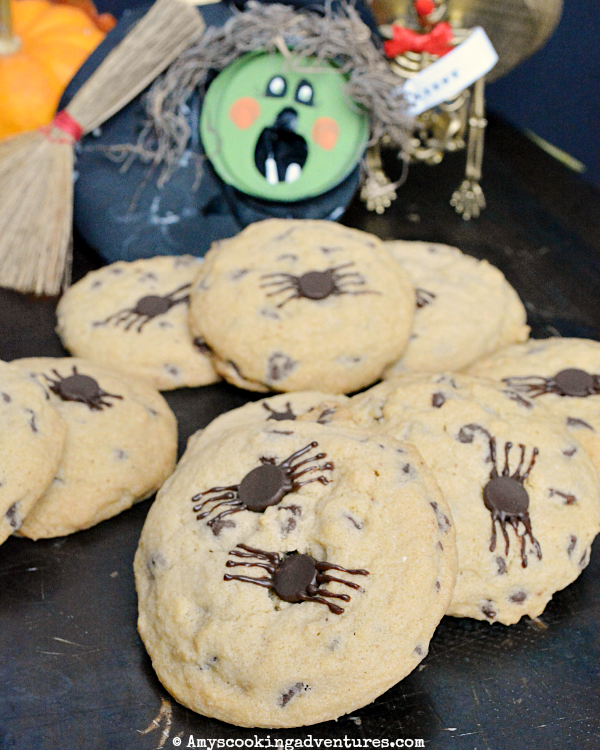 Spider Chocolate Chip Cookies are the perfect easy Halloween treat! Preheat the oven to 350 degrees F and line baking sheets with silicone mats. Place the butter and sugars in the bowl of a stand mixer and beat until smooth and creamy. Add the pudding mix and mix until combined. Add the eggs, one at a time, and mix each one thoroughly; stir in the vanilla. Turn the mixer to low and slowly add the baking soda, salt, and flour. Use a large spoon to stir in the mini chocolate chips and semi sweet chocolate chips.Use a 2 tablespoon scoop to drop the cookies onto the prepared sheets. Bake the cookies for 10-12 minutes or until the cookies are set. Immediately after removing from the oven, press 1-2 dark chocolate chips onto the hot cookies. Move to wire racks and cool completely. Melt the remaining dark chocolate chips and place them in a piping bag fitted with size 2 piping tip. 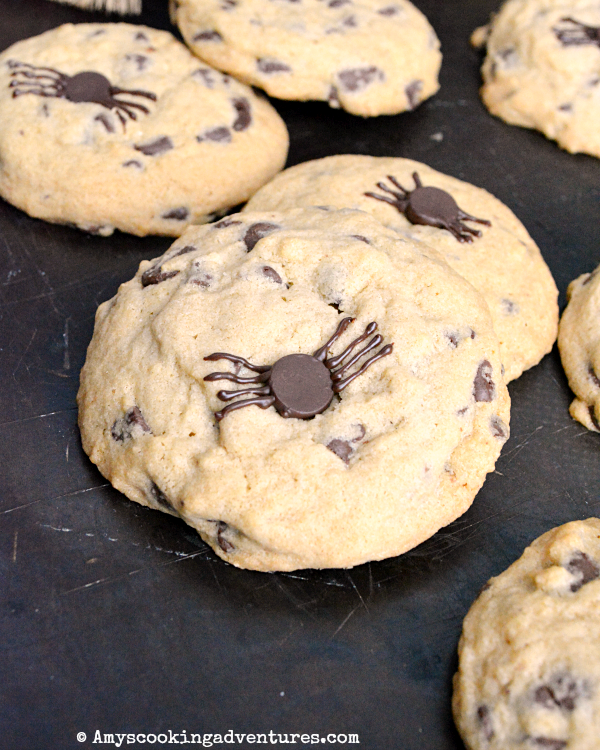 Pipe eight legs onto each chocolate chip to make a little spider.